UU Ministry for Earth is pleased to present a series of four “green papers” on the broad topic of environmental justice, including focus areas such as food, climate disruption, environment and health, and animal welfare. 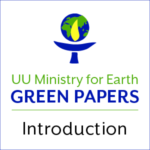 The papers, designed to stimulate thoughtful comment, interaction, and action by Unitarian Universalists involved in and concerned about the history, connections, and future of environmental justice work, were a result of a collaborative review and edit process that took place in 2009 with over thirty ministers, lay UUs, and UUA staff. Individuals and groups of UUs can use these green papers as a tool for deep reflection, discussion, and bold action. Green Paper 2: How Shall We Name Our Work? These green papers are available at no charge. If you find they have value, please make a donation to help cover our costs to produce them and our ongoing work.